Attention Webmasters! 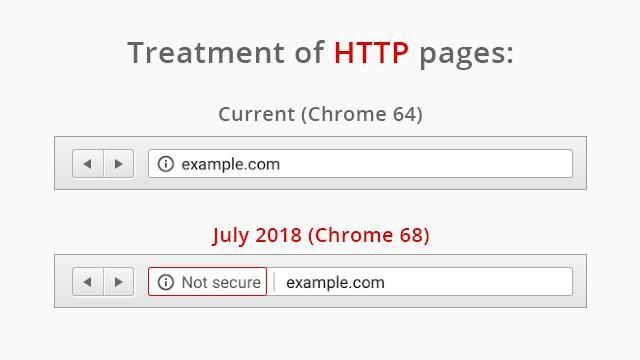 If you do not have SSL secure connection, Google will start marking “not secure” warning for HTTP websites in Chrome 68 from July. We can say this is Google’s most forceful attempt to encourage adoption of SSL certificates. Chrome browser will start labeling HTTP websites “Not Secure”. Google Chrome 68 is set to be released in July, will come with this special feature to hit websites with unsecured connections. The move is a part of Google’s several attempts to push the usage of HTTPS as much as possible. Earlier, Google had started to give higher-ranking in its search results for the web pages that used HTTPS protocol. Then Google Chrome started warning users about password fields on unencrypted web pages. And last year company had started labelling HTTP web pages “Not Secure” in its incognito windows. Now in 2018, Google has decided to make it fully mainstream, which will have a much wider impact than anything else done till now. According to Google, these moves are paying off. Google announced this move in its official blog post, that 68% of web traffic on Chrome for Android and Chrome for Windows is now protected with SSL certificates. For traffic on Chrome OS and Chrome for Mac, these figures are even more impressive at 78%. Plus, 81 of top 100 websites in the world now use HTTPS. These moves have collectively made the internet safer than it has ever been. And this is the success which has pushed Google to take such a bold move. HTTPS protocol secures the connection between your visitors and your website in such a manner that data sent by your visitors can be seen only by webmasters. It means no one can access your users’ private information which is transmitted through HTTPS web page. For example, if you have a login page on your website that asks your visitors to login, it should be protected with HTTPS so that no one can steal the username and password of your visitors by intercepting the traffic between your website and your visitors. Google itself has a Lighthouse tool and its audit helps to identify non-secure HTTP elements on secure web pages and leads webmasters to use latest and upgraded version of HTTPS with HTTP/2 settings. Ahead of security feature, SSL encryption will protect your website from ads injection, so it will help you to perform faster than HTTP. Google is enforcing now to migrate your HTTP website to HTTPS version to improve web-wide security standards, so move your websites on HTTPS if you’ve not done it yet. Before buying an SSL certificate, you need to consider your specific requirements such wants to protect a single domain or multiple sub-domains or different websites.